DON'T BE A WATCHER AND MAKE ME AN OFFER. 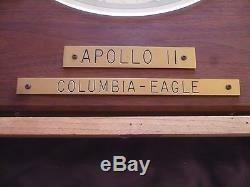 Official Mission Plaque One of a Kind Removed from NASA Facility Apollo-11 Columbia Eagle. 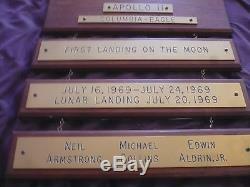 Commemorates First(1rst) Landing on the Moon. July 16, 1969 - July 24, 1969. Lunar Landing July 10, 1969. 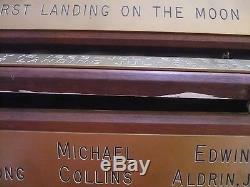 Neil Armstrong --- Michael Collins --- Edwin Aldrin, Jr. Only one ever made, one each for each NASA Mission. This plaque hung on a NASA Facility wall for a long time, slight faded. Also has paint splatters, etc. Hooks connecting the plaques are corroded and/or bent or broken. 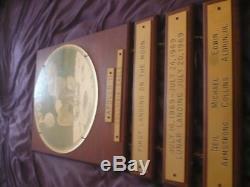 Plaque measures 16x20 on the main plaque, looks to be made of Walnut. 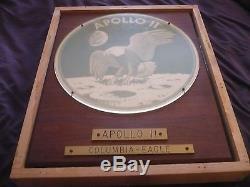 The item "Official Mission Plaque One of a Kind Removed from NASA Facility Apollo-11" is in sale since Monday, August 7, 2017. 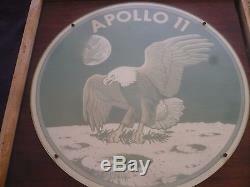 This item is in the category "Collectibles\Historical Memorabilia\Astronauts & Space Travel\NASA Program". 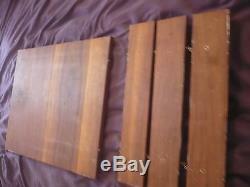 The seller is "ab-international" and is located in Leopolis, Wisconsin. This item can be shipped to United States.